14411 ft (4392 m) Highest point in Washington State . Mount Rainier is the highest volcano and the most heavily glaciated peak in the contiguous United States. It has been the focus of mountaineering and ski mountaineering activities in the Northwest for much of this century, and is a popular training ground for those planning future Alaskan or Himalayan expeditions. The massive snowfall (averaging nearly 700 inches annually, with a record of 1122 inches) builds a deep and stable snowpack which allows skiing nearly year-round on many areas of the mountain. Although about 5000 people successfully climb Rainier each year, only a few percent of them ski from the summit. 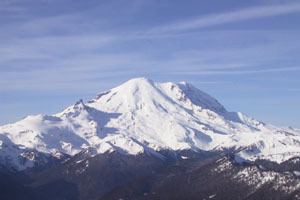 The first ski descent of Rainier did not occur until 1948, long after other volcanoes such as Adams and Baker. Many would-be summit skiers are deterred by the crevasse hazard, highly variable ski conditions (often frozen on the summit, with mush down below), and extra effort needed to haul skis above 14000 ft. However, in favorable conditions, the descents from the summit of Rainier via the Emmons, DC, or Fuhrer Finger routes are reasonably safe and extremely enjoyable ski runs. The skiable vertical of well over 10000 feet (3000 m) is the largest in the lower 48 states. (22 km) Shortest and fastest of the safer summit routes. Avalanche and rockfall hazard in 45-degree main chute in warm spring conditions. Continuous ski descent of 10400 vertical ft (3200 m) is possible from summit to Nisqually Bridge (first done in 1980). (40 km) A very long route, with several possible routes to high camp at 9200 ft. The best option is to ski directly up Tahoma Creek from the road closure (avoiding many miles of hiking the road), possible only in early season with heavy snowfall. Since the Tahoma Glacier is very heavily crevassed, a deep snowpack is necessary in order to make a ski descent from the summit feasible at all. (32 km) Extreme route, slopes to 50+ degreees. First ski descent in July 1996. Not nearly as exposed as Liberty Ridge, except at the top of the face. Skiable only with a deep snowpack which is not too windblown or icy for safe skiing. (29 km) Extreme route, slopes over 50 degreees. First ski descent in 1980, and rarely repeated. Extremely exposed, with several thousand foot drop onto Carbon Glacier possible. One skier in party of three fell 2000 ft to his death, May 1999. (18 km) Much less crowded than Muir Snowfield, this route is usually nearly crevasse-free in spring, and not too dangerous in early summer, although there are usually a few crevasses open. It joins the Muir Snowfield at 9000 ft, so one can ascend Muir and then descend this route. (18 km) Ski or climb up to Camp Muir from Paradise, then descend chutes to Nisqually Glacier and ski for 6200 vertical ft (1900 m) to Nisqually Bridge. Lower sections can become treacherous in spring as the snowpack thins due to swift river flowing underneath. Car shuttle back to Paradise, or simply park at the bridge and hitch a ride in the morning. (18 km) A fine alternative to Muir, with much steeper and more interesting ski terrain. As with previous route, can ski out to Nisqually Bridge before mid-spring in order to get a much longer run. (42 km) A grand 4-6 day tour, starting/ending from either Paradise or White River, and traversing around Rainier between 7000 and 11000 ft. Many opportunities for fine skiing during the many descents and ascents required to cross the various glacial troughs. See the new map and guide for more much information. (24 km) A fine route, without much crevasse danger on the relatively inactive glaciers. Best done in late spring and summer, when there is road access to Mowich Lake and fine corn snow. Earlier trips require many miles of skiing, snowmobiling, or hiking up the snowbound (or melted out, but closed) road. (30+ km) A long trip starting from very low elevation, requiring a long hike most of the year. Can ski up nearly to base of Willis Wall at 9600 ft, although the upper end is exposed to huge ice avalanches falling from the summit dome 4000 ft above. Unsuitable after late spring due to meltout/breakup of the active Carbon Glacier. (16 km) The lower portion of the Emmons climbing route, makes a superb day trip by itself up to Steamboat Prow. Stunning views of the Emmons Glacier from the Prow, and a consistent, moderately-steep pitch descends for 3500 vertical ft below it, often with perfect corn snow after late spring. The glacier is crevassed, but usually quite safe until midsummer. (26 km) This eastside route ascends Fryingpan Creek to one of the nicest sections of the Wonderland Trail which encircles Rainier. Multiple ski options heading south to Panhandle Gap, or SW below Meany Crest and then W up onto the Fryingpan Glacier. Minimal crevasse hazard before midsummer. (32 km) An extension of the previous route. 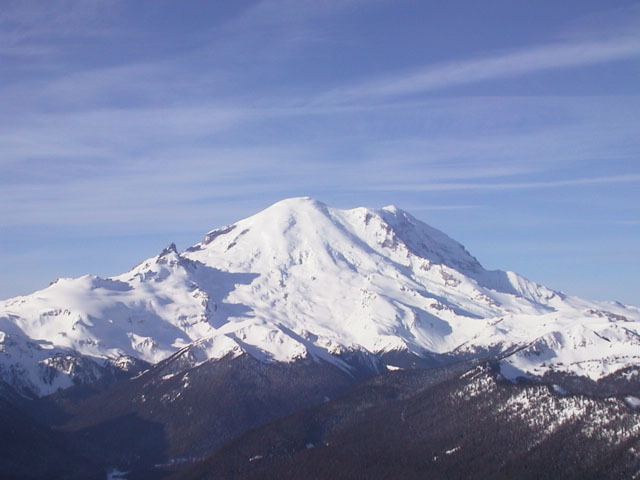 In good conditions, Little Tahoma, the prominent satellite peak east of Rainier, is skiable from up to 10800 ft (3300 m) in the east side gully. Above the snow, the route to the summit involves loose and exposed rock scrambling, and a hand-line or other protection would be helpful especially when climbing in ski boots. From the summit there is an unusual and stunning close-up view of the east side of Rainier, including the Emmons and DC routes. Flett/Russell, and possibly other routes.